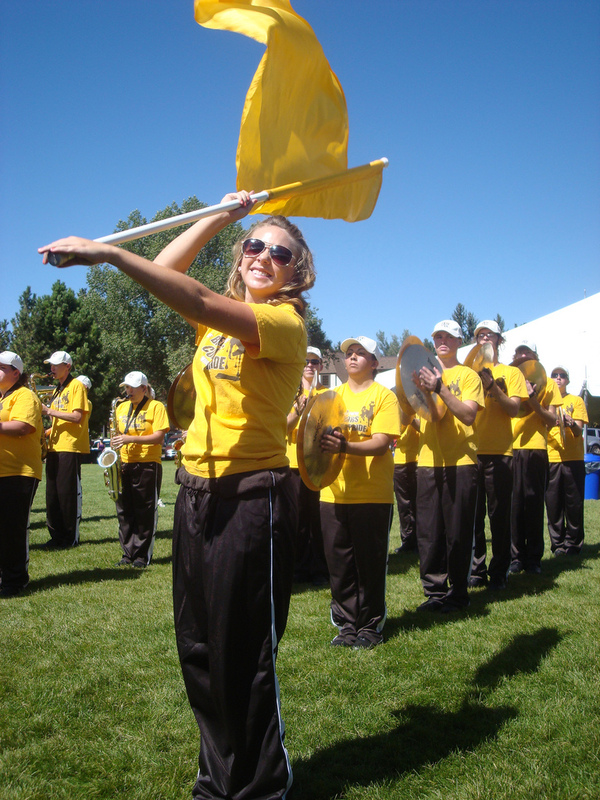 1) Brown and Gold Spirit: Liz Meier leads our brown and gold spirit as the Western Thunder Marching Band performs at the UW recruiting event, Campus Pass, this past Saturday. This is my sports action photo. I was working at the Campus Pass event this weekend and didn’t know the marching band would be performing. However, it turned out excellent because I could sit right in front of the members instead of being held back by the stadium fence. I think it is frustrating to have to take so many pictures to get one good one. The flag really got in the way of many of the shots. I thought the leading lines, the symmetry and the color complemented this picture well and turned it into an awesome shot. I also thought it was very interesting that her facial expressions never really changed throughout the entire shoot and she wasn’t ever looking directly at me, she just smiled because she was performing. 2) Mom, ca n I touch the chickens? 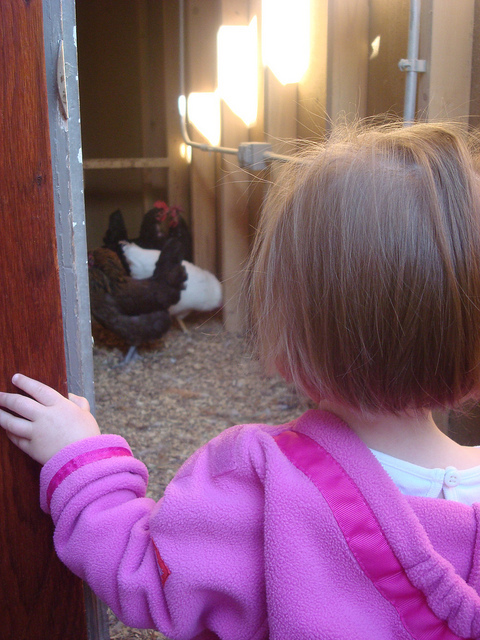 This little girl peaks inside the chicken coop door, as she asks her mom if she can go touch the chickens during the first presentation on Tour de Coop. This a feature photo. I decided to go on a bike ride around Laramie when I noticed all these cars and bikes parked by a house in Laramie. So my friend and I decided to checked out what happened to be Tour de Coop. It was difficult to get this shot because people were holding speeches and I felt bad getting in the way. I think her hand on the doorway shows that she is hesitating to go in but also very interested in what is going on inside. It captures the every day feeling of curiosity shown by children. I thought the rule of thirds worked well in this picture, as well as the background really helped make the picture symbolic of the event. 3) Looking through the wire: Looking through the chicken coup wire you can see two kids playing with the chickens at the Tour de Coop last Saturday morning. I think this is a feature photo, or a general news photo. I did stumble upon the event but this chicken coop was at the second house so I felt like it wasn’t as “stumbled upon” anymore. It was interesting to get this shot because my camera kept focusing on the fence instead of the children so I got frustrated. When I looked at the picture later I actually liked that the fence was in focus because it illustrated a different element of the chicken coop tour, that of the chickens. 4) Where did the football go? My godson throws the football over his head at the UW football game last Saturday afternoon. He was focused more on his actions than the actions of the UW football team. I think this photo is a sports feature. I did not know that the kids I babysit were going to be at the UW game, but when I saw them on my way out, I couldn’t help taking pictures. I think it is hard capturing children’s expressions because so often they pose. I love the expression on my godson’s face as he searches for the football. I think the picture follows the rule of thirds as well as motion, because of the blurred football. 5) Yummy! His face and lips express the pure joy of eating twizzlers this past Saturday during the football game. This is a portrait photo of a little boy who is just captivated by the bag of twizzlers outside of the photo. It was really hard to get this photo because he kept looking at me. But right in this moment he is so focused which I just love. I used cropping on this picture as a creative device. I learned that taking pictures of people is ten times harder than taking pictures of inanimate objects. I loved how each picture differed entirely from the previous shot. I really enjoyed watching the kids at Tour de Coop as well as at the football game. I learned that kids’ expressions provide great opportunities for great pictures! I also learned that I want a fancier camera, and I also learned that asking people for their permission before you publish their faces/names on the web is very important. I learned that it is better to ask them and make it less awkward from the beginning than letting the people (parents especially) be creeped out by someone taking pictures of their kids. I really enjoyed this project and if I had more time I would have loved to just explore every day in search for events like Tour de Coop.